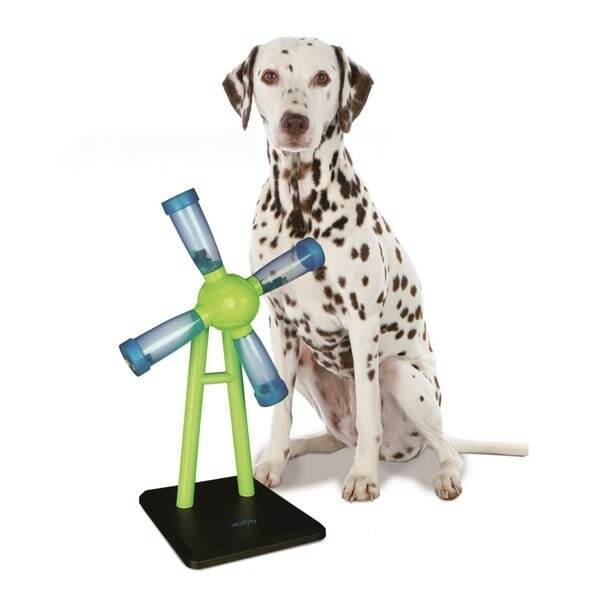 Channel your dog's playful energy with TRIXIE's Windmill (Level 1). Place treats inside any of the four beakers and once the windmill begins turning, the treats are released. Mix and match lids to increase the level of difficulty. Give your pooch this fun dog toy to capture his attention as he attempts to figure out how to retrieve his favorite treats from the toy. The toy's nonslip base provides stability while adding interest and fun to your dog's day, and the toy is dishwasher safe for fast and efficient cleaning when playtime's over. my dog likes the toy very much. my 20# cocker LOVES this gizmo. it makes mealtime extra exciting! so it's probably not the best option for bigger dogs, especially those who lack some measure of self-control. but the plastic is not that cheap, it's just not going to hold up if your dog's a frantic chewer. I like that the screw-on endcaps have nice, wide threads that go on easily and overall, the windmill spins smoothly on its axis. OF COURSE you have to weight each of the arms fairly equally -- that's basic physics. and since the kibbles have to be smaller than the openings in order to exit, you sometimes have to shove them carefully back in as you slowly rotate the 'mill' to fill each compartment, but it's a fairly quick learning curve. if you want to add a little fun to what can sometimes become the monotonous life of your fuzzy family member, this is worth a try. it's a joy to see them not just scarfing their food out of a bowl, but exuberently smacking the mill and watching w tail wagging as food comes flying in all directions (in a semi-controlled way--trust me, my pup finds every errant morsel). it's not just dinner; it's a dinner PARTY! I have a German Shepherd and Rottweiler mix who loves interactive games. She immediately started twirling the windmill. It's great that they have varying size holes so that some of the treats come out quickly to keep her engaged to try and get the ones with the smaller holes. This item is a great idea on paper; in use, however, it is dreadful. First, it is made of cheap plastic and is easily knocked over by even my small corgis. Next, if each of the four spindles do not contain equal weight, it spins for the heavy one to end up on the bottom. Don't waste your money on this! I was a little disappointed with this product. I have a small westie, and every time he tries to spin the dispenser, it falls over.